These wire armatures are mounted and ready to support a sculpture project. The pliable, non-staining wire easily adjusts to almost any position. Bases are made of formica laminated onto heavy particle board. Head and Bust Armature — 1/4" (6 mm) diameter wire. 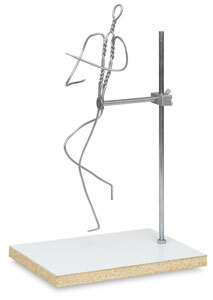 Figure Armature — 1/8" (3 mm) diameter wire.